When I decided to get New Super Mario Brothers U Deluxe my thoughts were that this was going to be a great game for me to just have around. You know, the type of game that is nice to just throw in every once in a while and have some fun. My thinking was that on the Switch a game like this is nice to have on the go to be able to play a couple levels, get a couple stars or play some mini-games on the handheld when I don’t feel like settling in and committing to a game. Well, what ended up happening was different than that and to me, that’s mostly a good thing. When booting up New Super Mario Brothers U Deluxe it is pretty much a straightforward Mario game, but a complete one. You have the option to play the base game or New Super Luigi U. Right from the start is a bunch of mini-games that can also be played. One of the major complaints levied at the game is that the price point is too high for a title that originally came out back in 2012 for the Wii U. I understand that debate and really can’t argue that for some gamers it won’t be worth a double-dip, especially those who already got their fill elsewhere. However, the fact that the game does include the Luigi content and that the entire game features quality level design and you get the added bonus of being able to play on the go adds a lot to the value proposition. If you never played it on the Wii U, there’s even more reason to pick it up now. The other thing, and the big thing, that makes this purchase worthy is simply the content. I referenced earlier about thinking that I would have the game to pick up and play when I wanted something to kill some time. This game killed time for me all right. Mario games are always some of the most fun I have in a video game. I will admit that I felt a little burned out on the New Super Mario Brothers series after we saw so many within a few years. Heck, this game originally released a mere couple of months after a different one in the series came out on the 3DS! So I was little surprised that I was enjoying it so much. In fact I played straight to the end, beat the game, and then went back for some extras and played some mini-games all within a couple of weeks. I think that this game is a good showcase for the level of expertise Nintendo has when it comes to level design. Things continued to feel fresh and the developers gave incentives to keep me playing. It also helps that I seem to have forgotten much of the game as I had beaten it years earlier on the Wii U.
I think it goes without saying that along with course design the controls also feel spot-on, as they normally do in Mario games. Well, at least kind of. You see, one disappointment I have with the game is no fault of the game itself. I simply did not enjoy playing in handheld mode as much as I would have liked. It works fine, but I definitely did not feel the control I needed and wanted that I would get from a D-pad on the Pro Controller. I know this is more of my continued complaints about wanting a Joy-Con with a true d-pad. However, as it stands, it’s just a little too difficult for me to control in some of the finer ways necessary in the more difficult levels. Nintendo has added in two new playable characters into the Switch version: Toadette and Nabbit. This opens up the opportunity for less skilled players to tackle the game. Toadette features slightly more responsive controls (less weight and less momentum) and she can even change into Peachette via a Princes Crown power-up. Then she can float and even gain a second jump. Falling into a pit will usually be averted thanks to an emergency jump that’s automatically initiated. Nabbit is super-easy mode, perfect for those of us with younger kids. He’s pretty much invulnerable and can walk right through enemies with no problem. Pits can still kill him though, so the kiddies will have to get good at jumping! These easier options, like we saw with Donkey Kong Country: Tropical Freeze last year, are great additions and make the game even more approachable than ever before. Other small tweaks really make the game stand out from the Wii U version. The graphics really pop on the TV with improved resolution. HD Rumble is prominent throughout and really adds that extra oomph to the gameplay. With over 160 levels, a bunch of challenges, and a pretty great soundtrack, the small improvements begin to add up. Overall, there is a lot to love in New Super Mario Brothers U Deluxe. Having both the Mario version of the game along with the Luigi version is a big value if you ask me. I haven’t played as much of New Super Luigi yet but when I played it on Wii U I personally enjoyed it more than the base Mario game. Between this, the secrets and collectables and mini-games, I feel that there is a lot of value in this package despite being recycled content. That’s just something that you’ll have to weigh out when deciding to pick up this title. If you do dive in to replay these games you will get plenty of solid content to enjoy on the screen or on the go. And if you haven’t played these games on the Wii U this is a must-buy on the Switch. 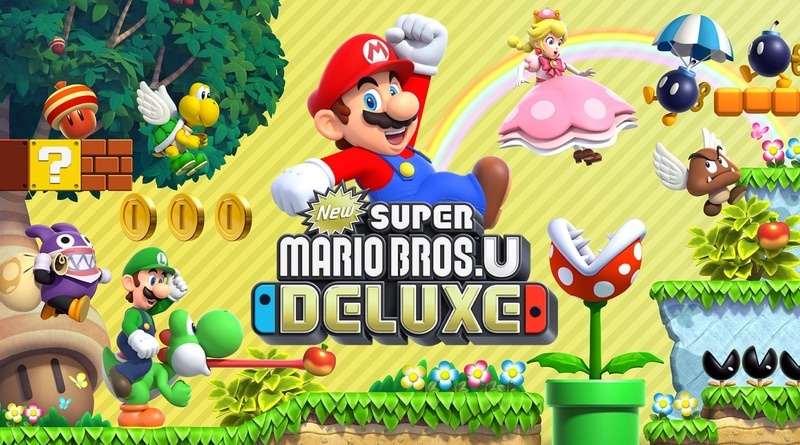 New Super Mario Brothers U Deluxe packs in a lot of content. It’s understandable to be hesitant to dive in at full price, however if you do you’ll be instantly reminded of the joy a Mario game can provide. If you haven’t played these games before it is a no brainer. Nintendo is as good as it gets in level design and control and this collection of the two Wii U games is a great reminder of this. Ben has been enjoying games since the NES but really got into it as a hobby with the launch of the PS2. Along with writing the occasional review he is a regular member of the Nintendo Times Podcast.